6:00am. Rain is lashing down. Wind rattles the tent. It’s forecast for the whole day. I have one hundred miles to cycle and two counties to climb. But it’s day seventy and I can’t fall behind now. Besides, I had already come through worse – I just have to keep moving forward. After four months of planning it all began on Shining Tor, the highest point of Cheshire. 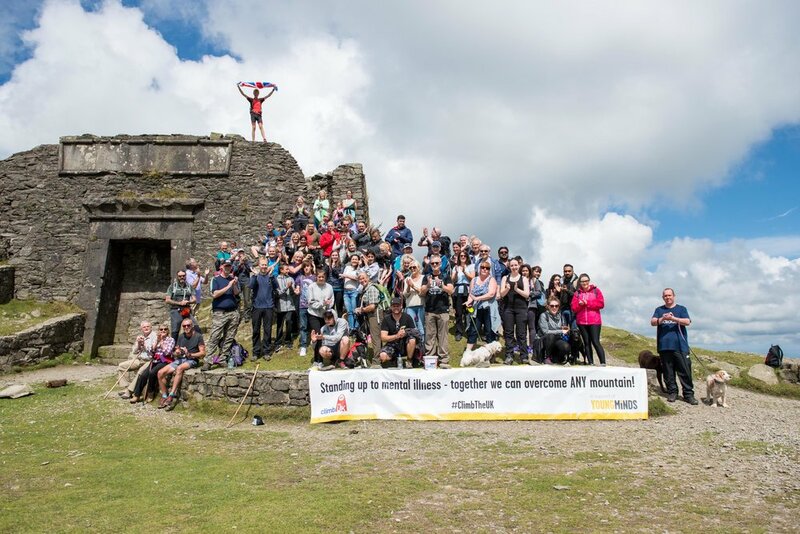 The top of my home county was a gentle start but the surprise of flags, balloons and friends gathered on the summit made for a memorable send-off. Back at the car park, I couldn’t find the words as I pedalled off towards Edale and left my family waving in the distance. Now it was just me, the bike, and one epic mission. The Genesis Tour De Fer touring bike and myself had met only a week prior. We would soon become both worst enemies and the best of friends. Hours trawling through maps on Viewranger had my entire route pre-planned, but at the foot of Winnats Pass I quickly regretted trying to make it ‘more interesting’ as we struggled up the 20% incline with twelve kilo panniers fighting against me. Soon the broad Peak District tops appeared and after walking Kinder Scout I retired to the lovely Edale Youth Hostel. By the end of day one my camera had broken and I had nearly lost my phone SIM card. Little do I know this has now set a precedent for the rest. I could hear nothing for the pleasing hum of spinning wheels and the skyline turned bleaker as I approached the Pennines with three county tops to climb. Along the tranquil Derwent Reservoir I walked towards Howden Moor and the summit of High Stones: the high point of South Yorkshire. On the notorious Saddleworth Moor the heat slowed progress to a crawl: staying properly hydrated is the first lesson. Day three was a shock to the system with 105 miles through Manchester, Merseyside and Lancashire. The ground was welcomingly flat, but on busy A-Roads cyclists fall to the bottom of the pecking order and concentration is needed to prevent climbing the windscreen of a Transit van. Luckily Billinge Hill (Merseyside) was only an easy stroll and I was relieved to be back in the countryside again as I arrived in the cosy village of Ingleton, North Yorkshire. A boggy trudge led to the summit of Gragareth where even the trig point was sat in a puddle. Sixty miles later the skies had turned for the best and the hills grew even bigger as I entered the Lake District. But something else stole my attention from the fells and crags reflected across Derwent Water: a stabbing pain appeared in my knee and persevered all the way to Borrowdale youth hostel that night. The sharp pain lingered stubbornly on the ascent of Scafell Pike the following morning. With an emergency physio appointment I got no further than Carlisle that evening. A medial muscle strain just five days in was far from ideal. Higher cadence reduced the pain slightly at the compromise of a slower pace but I had crossed into Scotland before I knew it. Determined to play catch up, a tough ninety miles took me to Glentrool, a village tucked away in wonderful pine forests. Galloway’s acclaim of Dark Sky Park revealed itself once the fiery skies flipped to darkness, and two summits down, I returned exhausted to my tent at 1:00am. The grimy streets of Belfast were quickly redeemed by the striking Mourne Mountains and Irish Stew for lunch in Newcastle on day seven. Powered by potato scones, I arrived late at an eccentric B&B in Omagh and crashed to sleep after another hundred-mile day. You never feel recovered in the mornings, but you quickly find your rhythm. In the beautiful County Antrim I stopped in the village of Bushmills to admire the fascinating landmark of Giants Causeway. On the summit of Trostan I was bemused to find an abandoned desk chair. Somebody was clearly having a bad day in the office. The Isle of Arran was cycling heaven with warm air and quiet roads. On the boulder-field of Goat Fell I could smell the sea and hear ships across the harbour whilst blinded in the fog. It was a far oasis from the suburbs of Glasgow and another petrol station sandwich for dinner at 10pm: dodging bottles from crowds of youths and arriving sore, weary and in low spirits. Walking after cycling always seems harder than the reverse. After a few miles of spinning the rhythm returns and somehow my legs feel stronger, but the long climb on the A82 to Rannoch Moor defied the rule. This unforgiving vast moorland would be a pretty bad place to break down. Fortunately what goes up must come back down, and free-wheeling into the dramatic valley of Glencoe was magical. Flanked by the Aonach Eagach ridge and the ‘Three Sisters of Glencoe’ this high mountain road is arguably one of the best. Bidean Nam Bian, the highest point of Argyll county, is the second summit of the day. This big ‘sister’ looks to be a moody one. Cycling shoes are swapped for Inov-8 fell running shoes and I’m off. Later I’m met with a puzzled look at Glencoe Youth Hostel, arriving in a relieved daze at 11pm with bike oil smudged on my chin and midges splattered up my arms. Ninety miles towards Ullapool had everything a cyclist could hate – headwinds, torrential rain, false summits and no coffee stops. Progress was so sluggish that I kept checking for a flat tyre, and talking to sheep stopped me going crazy. Keeping going was as simple as giving yourself no other choice. “Man, it takes me ninety minutes to get Durness just in a car” the bar-man muttered at the posh hotel in Kylesku as I left with my stash of water. Most nights finished in a race against the daylight, on a final boost of adrenalin, with the wild plateau of Assynt fading in my shadow like something from Middle Earth. Deserted single-track roads lead me to Durness on the North Coast 500 route, teeming with camper-vans, and great views across the pristine beaches and rocky bays. I was usually too late for dinner and a Mountain Fuel Hot Chocolate does the trick instead. The east coast had different plans. Coastal winds tossed me around whilst I braced myself for timber wagons thundering past at 60mph with a freezing spray of road water seconds later. At least it kept the bike clean! After getting changed in a phone-box and stopping for petrol station coffees in a bid to stay warm, I called it a day before hypothermia could. Scotland had plenty of surprises left as I crept into the wilderness of Cairngorm National Park and the lush pine forests where red squirrels roam and deer bolt onto the road. The moody Cairngorm peaks were unmistakeable, and high enough that I would soon be running over snow patches to the plateau of Ben Macdui. After ninety miles on wheels and fifteen by foot I was met by Rich in Braemar close to midnight. He followed closely by car the next day with hot drinks and The Proclaimers belting out to boost morale. His support was well-timed as a sudden bout of fever side-lined me later that evening. Feeling at my absolute lowest, I now had to walk up one of the highest: spluttering and heaving to the summit of Ben Lawers, and extremely thankful for the company. Passing the border into England brought a cheer of relief. Now I was on the home straight, albeit a long one. Home still felt far away in Northumberland – the most sparsely populated county in England. Even in the grassy Yorkshire Dales the sheep outnumbered people and I had no interaction for hours on end, but enjoyed the solitude of foggy moorland and charming villages of stone cottages. On the bigger rides, you have to break things down into small steps. 122 miles being the biggest of all. Luckily Lincolnshire was mostly flat countryside but the village greens got boring after a while. Whilst I had quickly mastered the art of grabbing Hobnobs from my panniers with one hand, I failed to drink enough in the oppressive heat. I was warned about the hills in every county I visited, but I just roll my eyes and nod. Hills didn’t bother me anymore – I had survived Scotland after all. On the other hand, everyone mocked Norfolk for the lack of hills. How could anyone but the alpine roadies complain at climbing just 700ft over sixty miles on cruising Fenland roads? Crab huts, lighthouses and colourful villages passed in a flash as I chatted to the mobs of Sunday cyclists. One hundred miles was almost too easy but gave the chance to refuel. After all, every cyclist knows that cake and coffee is the perfect combination. My friend Chris tagged along for a bold ascent of the highest point of Kent – which appears to be in a lady’s back garden. The landscape changed drastically into the warming leafy county of Surrey, whilst The Shard and skyscrapers were still in clear view from Leith Hill. The peace abruptly came to an end on the quirky streets of Brighton where we grabbed Fish and Chips on the flashing promenade and made a quick getaway from the Saturday night rabble. Riding between cooling swathes of ancient woodland in the New Forest was bliss. The sleepy stone-walled village of Beaulieu reminded me of Downton Abbey as I raced through to Lepe at the crack of dawn. I was late. Again. My desire to be as human-powered as possible now meant kayaking to the Isle of Wight. The gentle Solent crossing took under two hours with an instructor, James, close by. I dropped into a local primary school near the beach, and, dripping wet, told adventure stories to 120 eager students. Luckily none noticed the gaping hole in my shorts, and all cheered enthusiastically and inspired as I pedalled off to Boniface Down, the highest point, on the mountain bike I had hired. The rolling pasture and dramatic chalky headlands of the Jurassic coast of Dorset was one hidden gem. A prolonged climb revealed a sweeping view of the golden beaches as far as my eyes could squint. “Bloody hell!” I gasped in awe. At times like this it was hard to believe I was in my home country, but hard to feel alone with generosity in every corner: from charity donations, to free accommodation, and even a flapjack fairy sending surprise packages to see me through. Cornwall seemed equally warming with bizarre place-names that made me chuckle. Watching the sunset across the ocean was a fitting end to the day in Boscastle Youth Hostel. It would have been equally rude not to sample the namesake when passing through Cheddar, enjoying a Mature Cheddar Panini before meandering through the impressive walls of Cheddar Gorge; craning my neck in awe. It was into Wales for the final push. Unsurprisingly it was raining already. Flat roads are quickly a thing of the past. Instead it’s farmland, fields, and more fields. The bike was lighter now – I’d lost nearly a stone – but my appetite had gone and exhaustion was creeping in. “Relentless forward momentum” repeats in my head. Pembrokeshire has an elevation map like a heart rhythm. Up and down, for thirty miles. At the end I discover YHA Pwll Deri, a tiny Youth Hostel hidden away on the stunning coastline. Not a bad spot to enjoy porridge and coffee, but the endless blue horizon gives little sympathy for the hundred miles to come. Getting started is often the hardest part of each day. Bala needed no introduction as one of the wettest parts of the country. The cold is inevitable – and the downhills are like a blast freezer. It’s getting late and the planned accommodation is forty miles north. I have no choice but to cut the day short. There is either a solution or an excuse. My alarm went at 3:30am. A fierce spin out of Bala quickly warmed the legs as cattle eyes reflected in my head-torch beam. Wind turbines appeared on the skyline through a chilly pink sunrise and morning dew hung on the hedgerows. The descent towards Nant Gwynant felt like an Alpine pass and seemingly never-ending, until Anglesey came into view. One hundred and seven miles and eighteen hours later I was watching the sunset on the summit of Mount Snowdon and wondering whether I really wanted this journey to end. The final day. Only forty-six miles to the finish line. What could possibly go wrong now? The distinct mound of Jubilee Tower on Moel Famau urged me onwards. A final sting in the tail brings me to the car park where mum hugs me and I collapse into a heap. Luckily, it was only a short walk to the final summit of Moel Famau where over seventy supporters had gathered and perfect bluebird skies stretched across Wales below. The crowd cheered and clapped. 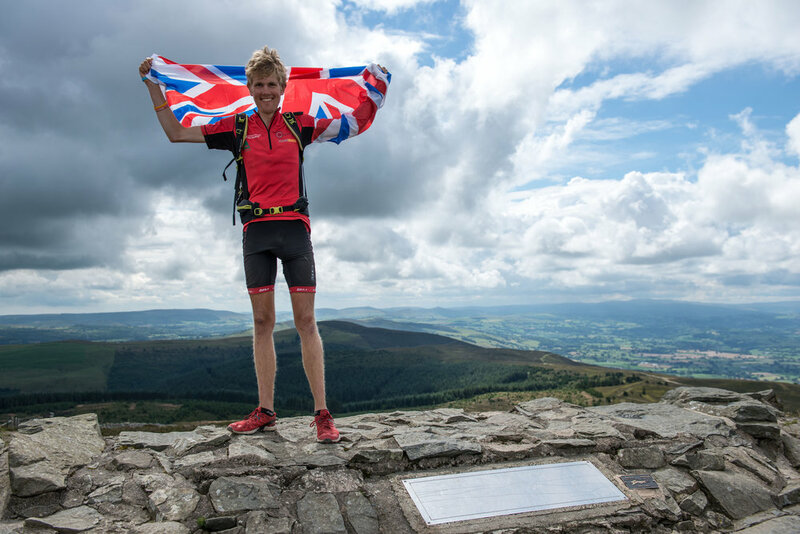 Seventy-two days later, I was about to become the fastest person ever to climb all the UK county tops and have scaled Mount Everest an equivalent of thirteen times. I’d been joined by over 150 others across the UK. The aim had been to raise £10,000 for youth mental health charity Young Minds in the process. Now the total had smashed £25,000 and changed lives for the better, because together, we really can overcome ANY mountain. Mental illnesses – depression, eating disorders and anxiety – are harder than any mountain I’ve had to climb, even all one hundred counties combined. But my journey had inspired others that mental illness is not a weakness, and that talking about it is the greatest sign of strength. Had it been a weakness I would not have been here now – dazed, elated… exhausted, clambering the steps and lifting the union jack above my head; grinning from ear to ear. Climb The UK was complete. I was on top of Flintshire; but now I felt on top of the world. Adapted from Alex’s upcoming book in 2018.